UI – Part 81 – Community (3 of 5) – Wake Up! Wake Up! Being Muslim is calling oneself part of the overall Islam community – the Umma. There is a sense of union, “solidarity”, as Ergun Canter describes in his book (pg. 123), Unveiling Islam, which “is prized above all else among Muslims….a family of believers in Allah…who value spiritual kinship more than individual freedom.” Islamic Law controls. The Five Pillars of Islam, which are ‘non-negotiable” act by “unifying believers under an umbrella of essential beliefs.” Unity of all Muslims is an objective – an objective which may be impossible to achieve. 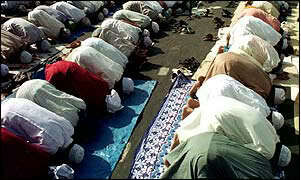 Many Muslims do not adhere to the daily practice (requirements) of Islam. Friday is the more important day of worship and many Muslims may attend Mosques that day. Some break from daily activities, like work, to face Mecca at the appointed hours, kneel on their prayer-rug and from memory repeat words many do not even understand. Pictures of such prostration have been shown of gatherings in France and New Yor k on the streets, disrupting the normal flow of business or daily life for those not so prone to be prone. This is prayer, but they do not pray. They say words in Arabic they have been taught to say. It is not a petition to Allah or God for fulfillment of promises, or such, like world peace. Sharia Law must be understood also to have an understanding of the ultimate umma as it is to exist in its purest sense (but who today determines purity of Islam?). It may, as a result of so many variations of interpretation and lifestyle, such as those in Muslim countries that say they are Muslim, but lack knowledge of their faith (Turkey is a prime example), yet fear retribution for being anything else, even questioning its essential elements, never exist in its pure form. The Umma-grand, the world all for Allah, may simply be impossible. Too many would have to die. To provide a view, not my own, from the website – http://www.usislam.org/85islcom.htm – defined is ‘family’ as part of the umma. “The community (Ummah) in Islam is not founded on race, nationality, locality, occupation, kinship, or special interests. It does not take its name after the name of a leader or a founder or an event. It transcends national borders and political boundaries. The foundation of the community in Islam is the attitude that designates submission to the Will of Allah, obedience to His Law, and commitment to His Cause. In short, an Islamic community is present only when it is nourished and fostered by Islam. Its foundation is the family. As you see this description is very significant and comprehensive. In this age of revolutionary media, no one in his right mind can underestimate the power of corrected actions, or the power of communication by words, or the power of feelings. Such a role of witnessing is both highly significant and extremely demanding. It means that the community of Islam must be exemplary. It must set the highest standard of morality and be the reference point of others. It must avoid excesses and extravagances and static rigidity. To strike a middle course of action, to be steadfast and consistent, to know what to accept and what to reject, to have morals and at the same time remain adaptable is probably the hardest test of human character and social viability. But this is the role of the Islamic community and the historic mission of Muslims. And it is the very criterion that qualifies the Muslim as the best human community ever to evolve. With regard to the continuity of the Islamic community, certain points are noteworthy. It is the duty of Muslims to do everything within their means to ensure that continuity. The rules of marriage and inheritance, the duties of charity and pilgrimage, the human rights and obligation of kin, the individual conscientiousness and social belongings – all these are oriented towards the healthy continuity of the community in Islam. On the other hand, God has pledged to protect this community in several ways. First, He pledges to preserve and protect the Quran that is the source of all wisdom. This also means that there shall always be a community to follow the Quran; the Quran shall not be without followers even though there are followers of other books. Second, Islam itself is continuity. Whenever a nation deviated from the path of Allah, He restated His word, reaffirmed His Truth, and commissioned new reformers to carry on. Thirdly, Allah has issued a strong warning to the effect that if Muslims turned away from the right path, they would be the losers, and Allah would replace them by righteous people, Sura 47, Ayah 38. From this outline above as to ‘family’, the words, “The foundation of the community in Islam is the attitude that designates submission to the Will of Allah, obedience to His Law, and commitment to His Cause. In short, an Islamic community is present only when it is nourished and fostered by Islam. Its foundation is the family,” clearly implies that the Muslim community cannot tolerate others. Other references state Islam in its best light (the question is as to ‘truth’) is, “the embodiment of the virtuous, the wholesome, and the noble. A truly Islamic community is the alert guardian of virtue and the bitter enemy of evil…” This sounds perfect, yet, as a reader of this Blog have you any sense that this could possibly be the case, indeed ‘true’? More, “It means that the community of Islam must be exemplary. It must set the highest standard of morality and be the reference point of others.” The idea of Muslim’s “commissioning new reformers” when members go astray, or replacing the Muslims that stray (convert to another faith), noting “they would be the losers, and Allah would replace them by righteous people.” Who are those so righteous? Muslims are commanded to be ‘strong against the unbelievers, fighting in the way of God (Allah, not the Trinity), and never afraid of reproaches.” Never ‘afraid of reproaches’ is symptomatic of the Muslim’s thin skin when it comes to doubt, or criticism, even cartoons, as they immediately raise the flag with the word ‘persecution’ emblazoned with the sliver of a red or green partial moon open to the right and a star as background. This is the flag the Islamists want others to see as a symbol of the ‘fear’ they can impose into others, scaring them, by their potential for terrorism, the possibility of bombings of Christian churches, their ability at attacks on fellow Muslims (those considered ‘moderate’) that do not adhere to local Laws or strict religious requirements, and more. It is an established pattern of abuse against all who ignore this shameful Ideology that engenders fear and restraint. May there be peace in the world someday. Until people realize that war is not an answer, hatred is not helpful, weapons from the least to the most destructive or not valuable towards the cause of freedom and peace, and that embracing a loving God (loving unconditionally, not requiring your love first) is good, we will never see peace. Peace may only come when the Final Judgment is meted. God Bless those who wait believing in our saving Lord and keep his commandments, having faith and being thankful for the one who provided salvation for all. If only all could know the loving God. It would be wonderful.